The Ole Miss volleyball team welcomed some new faces to campus in time for next year’s season. Already with a solid recruiting class, the team was looking to bolster the outside hitter position by looking at potential transfers. They found that keystone player in junior transfer Izzy Guzik. Guzik will be a welcome addition to an Ole Miss team that struggled to compete with top teams last year and ended the season with a disappointing 14-18 record. She will provide a presence on the court opposite first-team All-SEC performer Emily Stroup, who finished second in the country in kills last year. Coaches hope this will help propel the team to an NCAA Tournament berth next fall. 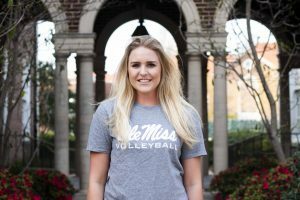 Ole Miss transfer student Izzy Guzik will join the volleyball team for next year’s season, following the team’s disappointing 14-18 season. Photo by Katherine Butler. This team has never had a problem with that, as current and former players attest to the tight-knit, family-like environment that surrounds Ole Miss volleyball. Guzik said the family feeling struck her right away and was a big part of why she felt comfortable making the transition from the University of Portland to Ole Miss. Associate head coach Ronaldo Pacheco reiterated the strength of the volleyball team’s chemistry, saying that the women are extremely welcoming and personable to one another. “The culture is really good with the group that we have right now and the newcomers, they won’t have any problem (trying to fit in) with what we are doing right now,” Pacheco said. Guzik said she has been surprised by some of the differences between the South and the West Coast where she grew up, especially when it comes to athletics and how people treat athletes. Guzik is excited to begin her Ole Miss career but said it is difficult adjusting to being so far away from home in California. Prior to her collegiate career, Guzik was a standout player at Westview High School in San Diego, where she helped lead her team to the 2013 State Regional Final. She was named First Team All CIF (California Interscholastic Federation) San Diego Section in 2014 and the All-American watchlist in 2015. She played for the prestigious Coast Volleyball Club in San Diego, which placed first in the Southern California USA Volleyball Girls Junior National Championships Qualifier, first in the Kansas City GJNC Qualifier and fifth place in the Open Division of the National Championships. Her team finished as the No. 1 team in southern California. “From watching film on her we felt that she was the best fit on the court, and getting to know her we felt she was a great fit off the court, so it just was a good get for us,” Ole Miss head coach Steven McRoberts said. After high school, Guzik committed to the University of Portland where after redshirting her first year and receiving limited playing time as a redshirt freshman, she finally had a breakout season as a redshirt sophomore. In 2018, she recorded 328 kills, 278 digs, 43 total blocks and 25 aces en route to an appearance in the quarterfinals of the National Invitational Volleyball Championships tournament.